The ST-116 is the next generation of D&V Electronics Ltd.’s very popular ST-16, built for the new era of automotive testing. Thank you for your interest in the ST-116. Please fill out the form below so we can send you the brochure. Thank you for your interest in the ST-116. Your request has been submitted to our sales department, and we will get back to you soon. 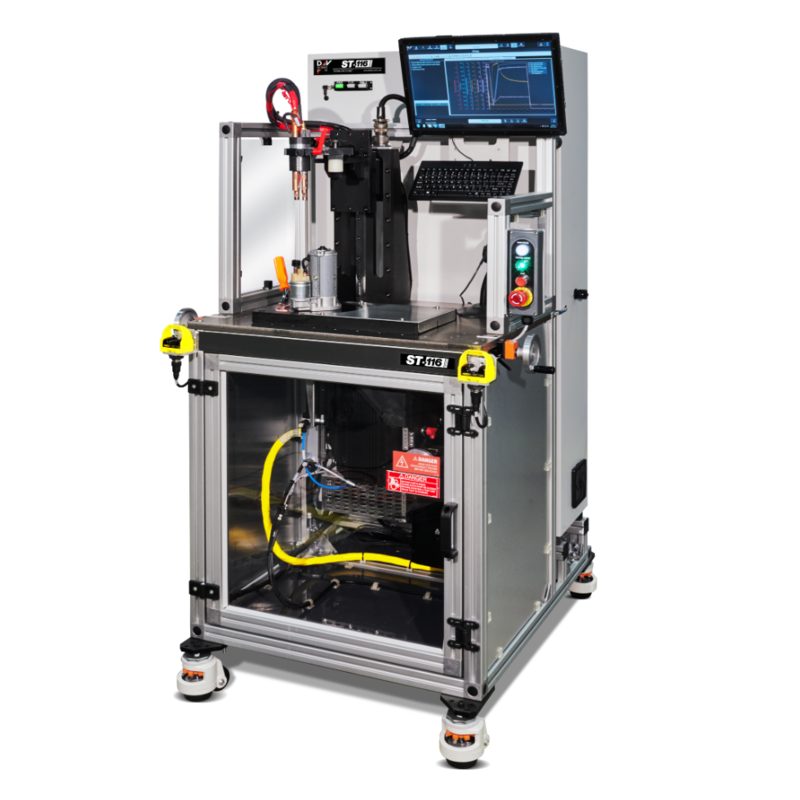 The ST-116 is built as a high speed, accurate, and robust starter motor testing system for customizable high-volume testing with automatic connections. This touch-screen PC-based machine is designed to achieve a fast test cycle time with minimal tooling change-over for End-of-Line production testing. The ST-116 is available in 200V and 400V class versions. The ST-116 has industry leading cycle time and optimized operator part loading. Precision product diagnostics with D&V’s state of the art data acquisition and processing technology. Flexible operation with manual or automatic connection tooling for a wide range of starters. Start-Stop and Change-of-Mind testing capabilities. Built-in digital oscilloscope and precise waveform analysis to diagnose armature, commutator and brush problems. Designed from over 15 years of experience, with operator health and safety in mind. The DUT loading point is close to the operator, providing improved ergonomics with less lifting and movement. On screen, step-by-step user configurable installation and setup instructions for error-free operation and minimal training. Effective material management. Programmable reject bin input, reject acknowledgement, marking device output, pass/fail labels and report generation. Tooling recognition by bar-coded components and hand-held scanner eliminates setup errors. Computer controlled programmable 1500 Amps starter power simulating 200 – 2000 CCA battery (0 – 30 milliohms). Computer controlled 120 Amp programmable solenoid power supply. Available in 200 V and 400 V class , 50/60 Hz. Includes standard double finger start or optional light curtain with whisker switch. Optional light stack for machine status indication in all directions. Tooling allows for flexible rotation and indexing of starter orientation. Quick clamp tooling rings optimize model changeover timing. With pneumatic clamp and available automatic solenoid contact head with radial, rotational, and height adjustment allowing for maximum versatility and productivity.